I would like to send you my best wishes for 2012. Me and my brother had a marvelous journey, thanks to you. I can ensure you that we will recomend you and your organisation to all of our friends in Belgium! I've added a picture for you taken from Everest Base Camp. The Tour guide and the driver, Dorji and Tashi were fantastic and made the trip a lot better than it would have been if we had other people. Dorji was fantastic, we would give him a 10 out of 10 and recommend him to any one of our friends and family, he was excellent. I am scheduled to depart from China tomorrow so I wanted to thank you for all that you have done for us. You have provided excellent service to us which has made this a wonderful experience. I am fine, how are you? Yes, I am back home already. The trip to Tibet was great, thank you very much for helping with everything. Everything on the tour was great, from the hotels to the meals. The tour guide and driver were really great too. Overall, the trip was really fun and a great learning and cultural experience and I also liked the fact that the chosen restaurants allowed me to have a taste of Tibetan cuisine. I have no complaints at all. Thank you very much for all your help and time, they were also immensely helpful. I appreciate the fact that you took the time to check in during the tour. We would recommend that in your Train Instructions to suggest that travelers bring their own food and/or snacks. We personally didn't care for what the café car served and could have brought some groceries (everyone else on the train certainly did). Thanks so much for all your service... regards, Ed & Kristen. Thanks again for a great trip and good organization. 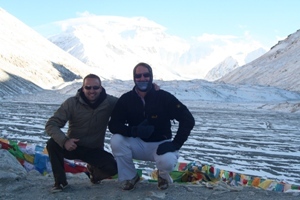 Alex (Rinchen) TseTen is one of the best guides I have ever had and he did a really superb job. the tour was very good. I am really happy that I chose you and your agency. Thanks for your support. My Guide Sangbu and my driver did a really good job and showed me many nice places! The hotel was also really good, clean and they spoke english (very important for me!) - nothing to claim! The food (lunch) was also really great, but I wished that we could eat in an more original and non-touristic restaurant. Thanks again for your support. I had a really great time! We have returned from our North Korean trip yesterday so are still trying to settle back. We have very much enjoyed our trip to Xinjiang. We have seen interesting places and our guides were nice. I would like to especially thank Sasha, our guide in Urumji and Turpan, who really made an extra effort to please us. If you can somehow transmit our appreciation to her bosses, I would be greatful. I just wanted to let you know that everything went very well with our trip to Lhasa. We enjoyed the program you set out and liked our guide very much. Also, the train tickets arrived at the hotel in Xi'an on December 3 as you promised. We are now in Pingyao (and it is very cold!!!). If I ever have a friend interested in traveling to China, I will highly recommend you. Thanks again for all of your help. I was intending to write back to you. We greatly enjoyed the trip and were very grateful to you for setting up the itinerary. 1. Dawa was excellent. Very good to us and knowledgeable. He was also willing to accommodate our needs as they came up. Very highly recommended. 2. The driver was also great. In spite of the dangerous roads we always felt safe. He was never late and always cheerful. 3. Most of the hotels were great. The only problems we had were with those that didn't have heating - but I think this cannot be helped. Otherwise the hotels were great. 4. The meals were great. Absolutely delicious. A quick suggestion - at the end of the tour we were taken to the Tashi Delek shopping center. It was overpriced and the salesperson was very pushy. I suggest you don't take other groups there. BTW - I moved my interview to after my trip and had it yesterday. It went well. Sincere apologies for my late reply. Coming back to school was quite busy -- but now that the week is ending I have some time to catch up on emails. Fisher, thank you for all your hard work in putting our tour group together. It was an incredible experience that we all absolutely loved! We were fascinated with Tibet and all the beautiful places that we had the opportunity to visit. Dawa was unbelievably great! We all became quite fond of him very quickly. He not only was an excellent guide -- but we almost felt as if he was our big brother. He showed leadership and dedication all along the way -- especially when one of the students needed to go the hospital. All along the trip he sang songs to us, told us stories about Tibet and his life, ordered for us at restaurants, taking us to a night club, gave us advice on where to go shopping, and kept good control over the group -- which is remarkable on its own given that there were 14 people -- 14 young people! The driver was great as well -- he at times went quite fast -- particularly up the mountain -- which scared many of us --- but overall he was a good driver and was able to get the bus out of a difficult situation in one of the town. The meals were in gerenal quite good --particularly at the hotel restaurants. Thanks again for everything Fisher-- we really had an incredible trip~!!!! Hi Fisher.......it's nice to hear from you again! Our trip to Tibet was wonderful. We came back to Shanghai last Friday and I left for Bangkok on Tuesday......that's where I am now, for some business meetings. Driver and car: The driver and car were fine. It was a Toyota Land Cruiser. We changed the itinerary for the 2nd and 3rd days so we could take day trips outside of Lhasa. We visited Ganden Monastery and Drak Yerpa Hermitage the 2nd day, and Yamdrok Tso Lake the 3rd day. These were all very scenic and interesting places which we were glad to have visited. Hotel: The hotel was fine. Very comfortable for the 2 of us, everything worked, and the location was excellent, just around the corner from Barkhor Square, which was very good. There is also an excellent cafe right next to the hotel which sells coffee and pastries and ice cream and has good internet access. It's called the Summit Cafe. Meals: all good. We ate breakfast at the hotel and our guide took us to a different place for lunch each day. So in short, we had a great time. I really appreciate the service you provided and your consistent responsiveness and flexibility. I will certainly recommend your company to friends considering a trip to Tibet. I wish you a fantastic time with your family. I thoroughly enjoyed my trip in Lhasa. Lionel and I want to thank you for looking after us especially during the train crisis. I'm currently in Hong Kong and will spend a few days here before I head back to Australia. Dear Fisher - just got back to Hawaii two days ago and was happy to receive this greeting from you. I hope you are doing well and that your holiday season is off to a good start! I wanted to say again thank you for your wonderful assistance with my journey. Your arrangements worked out perfectly with no glitches at all. Andy was so nice and helpful in getting me to the train station in Beijing and I LOVED the Xin Ding Hotel in Lhasa - it was FABULOUS and exceeded all expectations! Every amenity, excellent service and a picture postcard view of the Potala Palace from my room - what a treat! And I can't say enough good things about Nawag as my tour guide in Lhasa - what a beautiful person with a kind and compassionate soul - he was the greatest! Sorry for the slow response commenting on the itinerary. Since I have been home I have been very busy, but things are slowing down a bit now. Thank you for the tour that you put together for us! It was fantastic and all went very well. The guides were very knowledgable and friendly. We were always met on time and they accomodated our needs when things came up. The train rides were great and the soft sleeper was definitely worth the extra money for a little bit of privacy. We thoroughly enjoyed the ride to Tibet. It's always interesting to go places when we don't speak the language, but we managed just fine. The river cruise and the company chosen were great. It rained the whole time on the river, but that is just part of the experience. The staff was great and overall we really enjoyed it. Thanks again for putting this together for us. I have had only positive comments about the tour you arranged for us and your continual communication in arranging it. Thanks again and we will keep your name for future China travels. We are back in Shanghai from Tibet! It has been an incredible journey, all went smooth and well. The local tour guide and driver were excellent, we felt very comfortable with them. The hotels were satisfactory, the activities were according to plan, even we visited farms and had lunch with the local farmers which is very very interesting. The train travel from Shanghai went very smooth although it was just before the Chinese New Year, all my worries were not necessary. The view along the way was breathtaking! Thank you so much for your service, I chose your company because you answered my emails very promptly and your price is very reasonable. I had contacted two Shanghai travel companies but their replies were very slow and also they were more expensive. You are more professional and I congratulate you! I would definitely recommend your company to my friends for travelling to Tibet. Hopefully we will go again sometime in the future because Tibet is just beautiful and there are still many corners to visit. Thank you again Ricky!